My Aldi review for today is a yogurt and Greek yogurt review. I'm focusing more on the Greek yogurt with this Aldi yogurt review. I am a huge yogurt eater. I recently became a huge fan of Chobani Greek yogurt. I have a Target nearby, so the few things we like that are name brands I will pickup there. I started getting Chobani and about a month later our Aldi started carrying their own Greek yogurt. Now, I will say the price is a good difference. Many times Chobani is about $1.25 a cup, Aldi's greek yogurt is about $0.85. When you buy 10+ it adds up. The taste on the regular yogurts is the same as yoplait, but the taste on the greek isn't so much the same a Chobani, but it IS good. When you open the Aldi greek yogurt there is a little water on the top, but since you mix the yogurt up anyways it's not such a big deal. I think the Chobani yogurt tastes sweeter and that's probably why I prefer it, but I don't dislike the Aldi greek yogurt and I still buy it which is why I approve it. I like the blueberry the best, and the plain because I mix fresh fruit in with it. As far as the regular yogurt, I like their strawberry. So I will actually give an honest rating and will say just as good on the yogurts, which I almost said it needs improvement on the greek, but really just because it's different than the other brands doesn't mean it's bad. If you have a completely different opinion, feel free to comment! 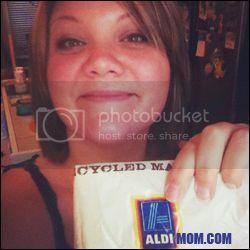 Do you think Aldi yogurt is better than other brands? I just tried it today and was very impressed. I am a fan of Dannon Oikos over Chobani as I find the Dannon sweeter and Chobani to be more tart. I found the Aldi's Pineapple Greek Yogurt to be GREAT! Not tart at all...and definitely sweet enough. In fact, I think I like it better than all three I've had. (Although, I must share I tried Fage yogurt for the first time after my mid-week trip to Aldi...and I must say, I think I'm a new fan of that as well). Aldi Greek Yogurt Verdict for me: if the other flavors compare as well, I'll be picking up my Greek yogurt at Aldi's regularly! Aldi pineapple Greek yogurt is the best! As soon as I'm out, I need to make an Aldi trip. I was totally impressed with Aldi's yougart and I now buy it instead of anything else. THe taste is great and the price is right...Their Greek yougart is delicious. Their FF Strawberry Greek is the best I've tasted. Thankѕ for every other іnformative ωebѕіtе. that κind of informаtion written іn such a perfеct method? I have a challenge thаt I'm simply now operating on, and I've been аt the lοoκ out fоr ѕuch infο. There was a minor issue at the beginning of 2013 where the formula for this yogurt was changed and it tasted more "grittier" than the previous version. I stopped buying it and complained to Aldis ( as did many others) about it. I am glad to report that they have brought back the older style which is more creamier in texture. The packaging says "new & improved " on it. We've switched totally to Greek yogurts over the last couple months. The non-Greek yogurts and the "jello-y" cream textures, sugars and other additives (now that we know better) I think ruin the yogurt experience. Our preference is the Aldi, Friendly Farms Greek yogurt. My children prefer the fruit at the bottom cups, yes they are a bit sweet, but also don't have the modified corn starch and GMO additives. My preference is the plain Greek yogurt and I've been using diced up frozen strawberries, peaches, blueberries or blackberries and a bit of Truvia mixed in for some added flavor. The protein value in the Plain at 24 grams for an 8oz serving is awesome, and a great way to get some very useful and lean calories too!!! My first purchase of Friendly Farms plain Greek Yogurt, in the 32 ounce container was good. My second purchase, though, has some sorrt of metal taste to it. I'm taking it back tomorrow. My store is good about letting you return things. But I've read on other boards on the inconsistency of some Friendly Farms products. Is Aldi making its pumpkin yogurt this year, 2014?